NCCPR Child Welfare Blog: Want to hide a foster-care panic? It’s easy! Just file lots and lots of court petitions! Want to hide a foster-care panic? It’s easy! 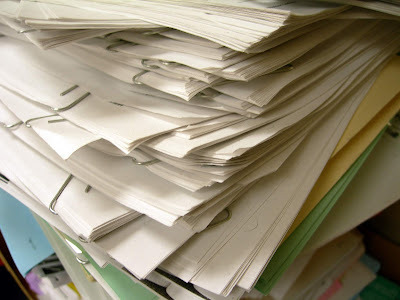 Just file lots and lots of court petitions! In every way, at every point in the process, a foster-care panic hurts children. And so far, nearly a year-and-a-half after getting the job, New York City Administration for Children's Services Commissioner David Hansell has done nothing about it. Buried on page 4 of a report from New York City’s Independent Budget Office is an alarming statistic: During City Fiscal Year 2017, the number of children thrown into foster care at one stage of the process soared 30 percent over the previous year. And in CFY 2018, which ended June 30, removals stayed at nearly that same, much higher, level. This jibes with what a report from the Center of New York City Affairs found. Their recent report, discussed in this previous post to this Blog, covered a slightly different time frame, but found almost exactly the same rate of increase for so-called “emergency” removals – in which the city’s Administration for Children’s Services takes the child on-the-spot and then goes to court to try to get a judge’s approval after-the-fact. While depressing, the figure is not surprising. It’s a classic foster-care panic, a sharp, sudden increase in removals of children from their homes following the death of a child “known to the system” that gets enormous media attention. But apparently, ACS has a new excuse to try to pretend this foster-care panic doesn’t exist, and, it seems, the budget office bought it. As you may recall, Excuse #1 was that removals hadn’t increased at all. That wasn’t true. Then cane Excuse #2: Well, o.k., we admit the number of children torn from their families increased but only at the same rate as the increase in child abuse investigations. That wasn’t true either. 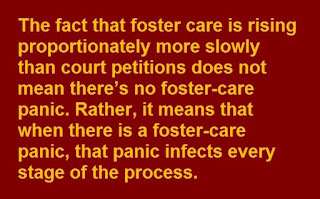 So now, behold Excuse #3: Supposedly, there is no foster-care panic because the proportion of petitions dragging families into court that result in foster care has declined a little. That, of course, is not because the number of children removed as declined. Rather it’s because the number of petitions, many of them unnecessary, has skyrocketed at a rate even faster than removals. So the fact that foster care is rising proportionately more slowly than petitions does not mean there’s no foster-care panic. Rather, it means that when there is a foster-care panic, that panic infects every stage of the process. ● Professionals who are required to report alleged child abuse panic. The law in New York says they should report when they have “reasonable cause to suspect” abuse or neglect. But now they’re terrified of being fired, suspended, demoted, pilloried on the front page - or worse. So they are more likely to report anything and everything no matter how absurd. So reports and investigations go up because of a foster-care panic. ● In some cases, ACS workers are terrified of those same consequences if they say a report is unfounded and then something goes wrong. So they label a greater proportion of reports as “indicated” (New York’s term for what most states call “substantiated”). In New York, it means only that the caseworker thinks there is “some credible evidence” of abuse or neglect – even if there’s more evidence of innocence. So the rate of substantiation increases because of a foster-care panic. ● In other cases, those same workers are terrified of those same consequences if they decide that, So they file vastly more court petitions and drag far more families into court because of a foster care panic. even though there’s a problem, it can be handled without dragging the family into court. ● In still other cases, those same workers are terrified of those same consequences if they decide only to drag the family into court. So they remove the child on the spot. 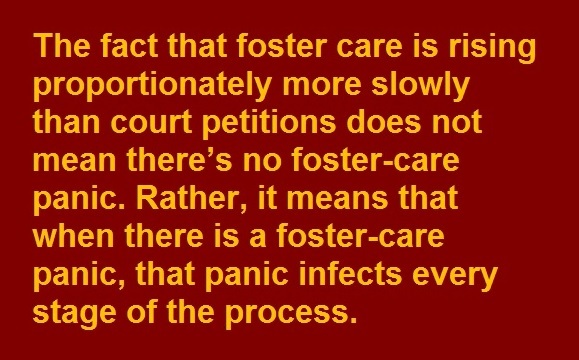 So the number of children thrown into foster care increases because of a foster-care panic. In short, the whole point of a foster-care panic is that it lowers the threshold for interfering in a family at every stage of the process. 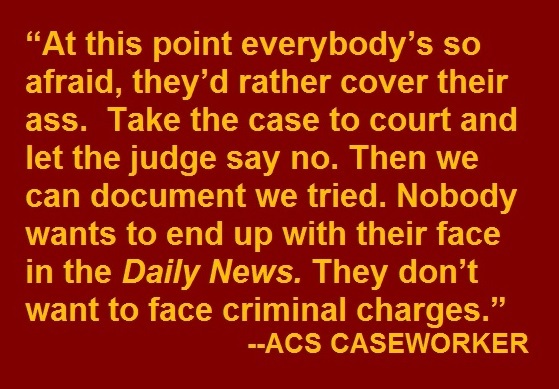 And while ACS seeks to portray its approach as more benevolent – see, we’re only seeking court supervision, not foster care – that also is probably misleading. 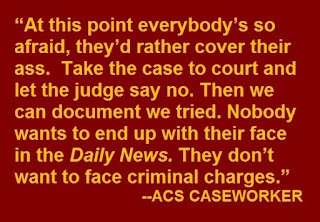 New York City is unusual in the extent to which high quality defense counsel is available to indigent families caught in the ACS net. With their own support staff, they can craft alternatives to the usual “cookie cutter” service plans offered by ACS, and show judges that there are ways to keep children safe in their own homes even when ACS would prefer to remove the children. That means both that judges are less likely to rubber-stamp ACS foster care recommendations and ACS, knowing it will face real opposition, is less likely to recommend foster care where it’s not necessary. Past ACS administrations do deserve credit for supporting this approach to family defense, even as other places in New York State reject it. Why did the IBO seem to buy it? I don’t know why the Independent Budget Office seems to have bought into the latest installment from the ACS Excuse of the Month Club. But it might be because they’ve also bought into the Big Lie of American child welfare. Repeatedly, the report claims that there is a “natural tension” between the goals of keeping children safe and keeping families together. In other words, IBO appears to accept the false assumption that family preservation is inherently risky but if you tear apart the family you might traumatize the child terribly but at least she or he will be physically safe. But in the overwhelming majority of cases, family preservation isn’t just more humane than foster care, it’s safer than foster care. There is a tension, alright, but there is nothing natural about it. It is artificial, created by those wedded to a take-the-child-and-run approach to child welfare, and politicians seeking their 15 minutes of fame at children’s expense. In fact, the problem with foster-care panics, at every stage in the process, is that they harm children. Children are harmed when they are victimized by traumatic investigations and stripsearches. Children are harmed when cases are wrongly substantiated and their parents wind up barred from jobs working with children because they’re listed in a central registry of alleged child abusers with little or no way out. Children are harmed when families are forced to jump through all sorts of meaningless hoops while under court supervision. Here’s a case in point. Children are, of course, harmed by needless foster care. And children are harmed when all those extra investigations, all that extra court-ordered supervision and all that needless foster care steals the time of workers from finding children in real danger who really do need to be taken from their homes. In every way, at every point in the process, a foster-care panic hurts children. And so far, nearly a year-and-a-half after getting the job, ACS Commissioner David Hansell has done nothing about it. Instead, he's cranked up the ACS excuse machine to try to persuade us that what's right before our eyes isn't happening.